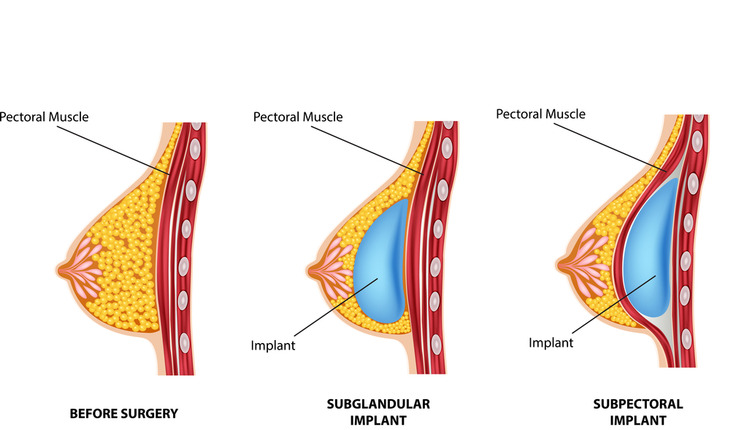 Since implants are foreign bodies, they can cause various problems: Many women find that that their implants feel hard and look unnatural, or that they’ve lost all feeling in the breast, or that their breasts are distorted and asymmetrical. Further complications include infection; rupture; capsular contracture, in which scar tissue forms around the implant and becomes hard and painful; and extrusion, in which the implant erodes through the skin. All of these problems are exacerbated by radiation treatment, which is considered a relative contraindication to implants. In general, implants problems can be resolved by removing the implant with the entire surrounding capsule and repairing any muscle or skin around it. When faced with the prospect of multiple repeated surgeries that are often required to remove and replace an implant throughout a lifetime, a woman should consider the alternative – surgery that creates a breast from her own tissue, a permanent breast that is also natural. Multiple studies have shown that any breast reconstruction that uses the body’s own tissue, known as autologous tissue reconstruction, provides higher levels of patient satisfaction over the long term compared to implants. Since it is made of your own tissue, the restored breast is soft, warm, and behaves just like any other part of your body, growing or shrinking as you gain or lose weight, for example. If nerves are reconnected, the breasts can even regain sensation. Autologous tissue breast reconstruction has been around for a while, but older procedures sacrificed muscle to rebuild the breast. New advances have made it unnecessary to sacrifice muscle from the donor site to create a new breast. Preserving muscle enables faster recovery and means a woman can maintain muscle strength over the long term. This new type of breast reconstruction, called “perforator flap” breast reconstruction, has become the gold standard of breast restoration. Perforator flaps are achieved by using microsurgical techniques to carefully transfer fat and skin along with a blood supply to create a new breast, while preserving the underlying muscle. Perforator flaps adhere to the plastic surgery principle of replacing “like with like.” Perforator flaps are appropriate for most women. “Patients falsely believe that very thin women are not candidates for natural tissue breast reconstruction. This isn’t true. In our experience the body provides the right amount of donor site tissue to suit a woman’s proportions. ● Abdomen: The most common option is the deep inferior epigastric perforator (DIEP) flap, which preserves abdominal muscles and improves outcomes for patients compared to the traditional TRAM flap which, sacrificed the muscles. The DIEP flap reduces the risk of infection and other postoperative complications and speeds recovery time. The DIEP flap removes excess abdominal fat, providing the equivalent of a cosmetic tummy tuck. ● Thigh: The profunda artery perforator (PAP) flap uses fat from the upper inner and posterior thigh to reconstruct the breast and is typically used when the abdomen is not serviceable as a donor site, either because a woman is too thin or because of previous abdominal surgery. The PAP flap removes excess inner thigh fat, providing the equivalent of a cosmetic thigh lift. While less common, other perforator flaps can also be used to transfer excess fat and skin (while preserving muscle) from other areas like the back or the buttocks to restore the breasts. Women today have a lot of options for breast reconstruction and can make educated decisions about what is best for them. State-of-the-art procedures restore a soft, warm, and living breast that looks and feels natural while preserving muscle strength and minimizing postoperative recovery time. Nerves can be reconnected to the living tissue to bring back sensation. For women who have suffered from pain and discomfort after implant-based breast reconstruction, natural tissue breast reconstruction is a safe and reliable way to bring back health, confidence, and quality of life.